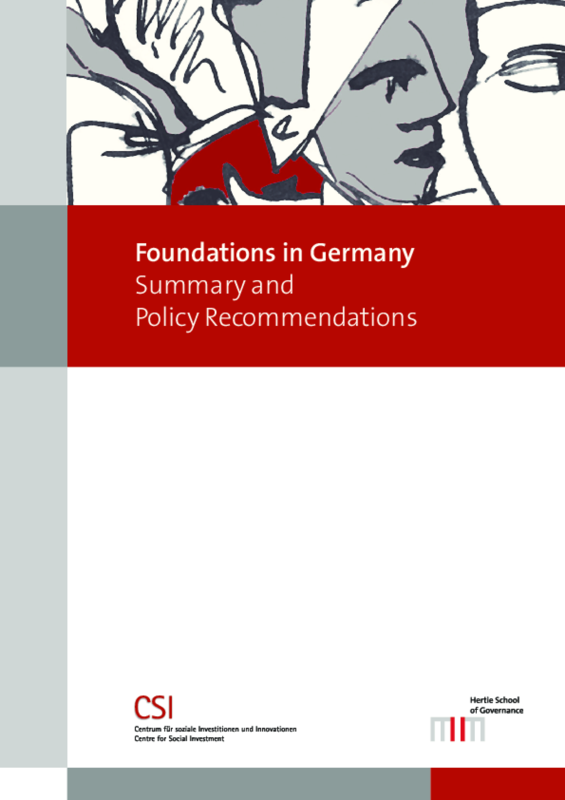 This study intends to complete the current understanding of the role, positioning and contributions of foundations in Germany. It is a joint project of the Hertie School of Gover-nance and the Centre for Social Investment of the University of Heidelberg, led by Helmut K. Anheier. It investigates the following questions: What are the objectives of foundations, and what roles do they see for themselves? How do they position themselves with regard to the state, market and civil society? What are their comparative advantages and disadvantages, and how do they benefit society? Finally, what are the implications for foundations and policymakers? In answering these questions, the project collected and analyzed a range of quantitative (survey research, available statistics) and qualitative data (expert interviews, case studies, focus groups), and did so for foundations as a whole as well as in specific activity fields: education, higher education, social services and arts and culture. Copyright 2016 Centre for Social Investment at the University of Heidelberg, Hertie School of Governance.